We’ve all smelled our kitty’s breath when it wasn’t as “fresh” as it could be — when the smell of fishy cat food became a just a bit unbearable. That smell can be a sign of periodontitis, or dental disease, in your cat. And the bacteria that cause dental disease are the same bacteria that can travel throughout your kitty’s system to cause lung, heart and kidney problems. Keeping your cat’s mouth and teeth healthy can be as simple as having regular dental checkups with your veterinarian and brushing those teeth at home. With a few simple instructions, you can add years to the life of your pet. Oh, and if you think this is something your cat will never, ever in a million years allow you to do, just wait till you hear the story of Midget. You can purchase a cat-sized dental brush at your veterinary clinic, online or at a pet store. These toothbrushes are typically smaller, softer and more flexible than dog toothbrushes. You can also use a soft, rubber brush that fits over your first finger if that is more comfortable for you. You’ll need to buy some feline toothpaste. Manufacturers know that cats love the smell and taste of fish, so they flavor the toothpaste with either fish or chicken to make it more palatable for your cat. Note: Never use human toothpaste with your pet, because it contains chemicals that may be harmful to her digestive system. 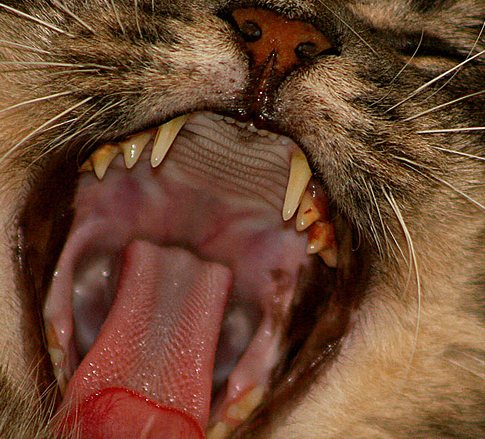 Brushing daily is the best way to ensure that your cat’s mouth stays as disease-free as possible. However, even brushing a couple of times a week will cut down on the buildup of bacteria. If you have a new kitten in the household, begin brushing now while she’s still little. Not only will it help to acclimate her to the process of brushing, but also starting early can keep her from having dental issues as she matures. What If the Cat Resists? If she resists sitting in your lap for the brushing, you may need to resort to wrapping her in a towel like a burrito to accomplish the job. I don’t recommend this if she’s an older cat or if she has any health issues, as you don’t want to overstress her. If wrapping her is not an option, try just brushing two or three teeth at a sitting until you get them all cleaned, spreading out the process over a couple of days. Brushing your cat’s teeth the right way can help keep her happy and healthy — but you’ll still need to see your veterinarian for regular dental checkups and possible veterinary cleanings. And now for a personal story that may help if you have a very recalcitrant cat. Remember how I mentioned Midget the cat earlier? My little tortoiseshell calico was just a wee thing when I found her in the bushes of the clinic where I was working. She couldn’t have been more than 3 or 4 weeks old, and we couldn’t figure out if someone had just dumped her there or if she had gotten separated from her mother. So of course, I took her home and bottle-fed her until she was old enough to eat solid food, and there she stayed — growing up to be a fat, and mostly happy, little cat. Because I was feeding her solid food, Midget didn’t really need a veterinary cleaning until she was around 3 years old. So at 3½, she had her first dental procedure, which I performed under my vet’s supervision. Once she got home from the clinic, Midget pouted. She ran under the bed, she hid behind the sofa, she stayed in the closet… anything to let me know that she was unhappy at me for taking her to the clinic. But I was determined to continue keeping her teeth clean by brushing them at home daily — something my Midget was very averse to me doing. As she proved by running away every time she saw me pull out the toothbrush. Finally, one day I managed to corner her in the closet and I snatched her up, threw her in my lap and proceeded to use the tiny kitty toothbrush on her teeth — which she promptly bit down on and held onto like it was her lifejacket in a rough sea. Of course, once she realized that, she also tasted the toothpaste that was on the brush… Ppttthewy! out came the toothbrush and the toothpaste all over my pants. But I was still determined. And I had a plan. By the next time I cornered her, I had mixed the “nasty”-tasting toothpaste with enough liquid from a can of tuna in water to make a thin gruel. She sniffed the brush, stuck her tongue on it and then licked the brush again. This time, even though she grumbled like all irritated kitties do, she let me brush her teeth. The next day, I lowered the tuna-water content of the toothpaste mixture just a bit, and brushed her teeth again. Every day, the toothpaste became less of a gruel and more of a paste until she didn’t even notice when the tuna-water was missing… and I was still brushing her teeth. The whole tricky job took a couple of weeks, but I had triumphed. Moral of the story: When you have a very smart cat, it helps to be just a bit more devious.